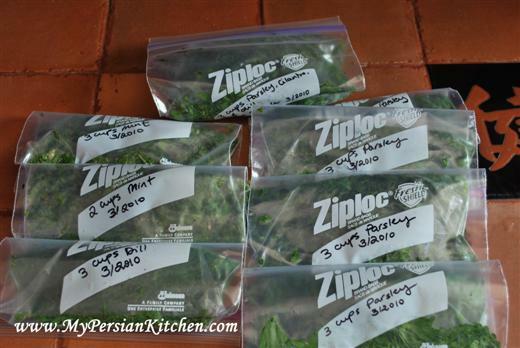 Freezing herbs is a good way to save time in future cooking sessions. All you have to do is simply empty out the contents in the pot while cooking. 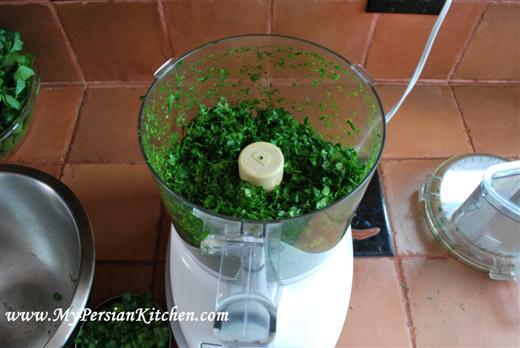 Also, it is a cheaper alternative to buying frozen herbs at the Persian markets. Here is my Sabzi Polow mix. I took the liberty to take the quickest way in making this process fast. 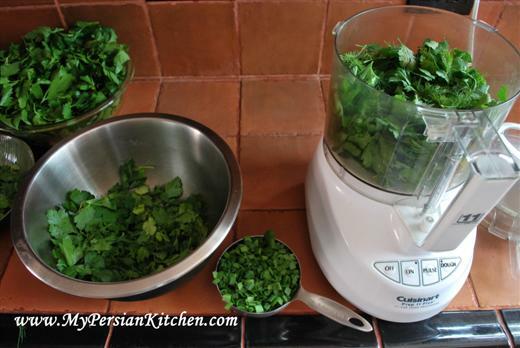 I simply used my Cuisineart to chop the herbs. The trick is to use the pulse button a few times. 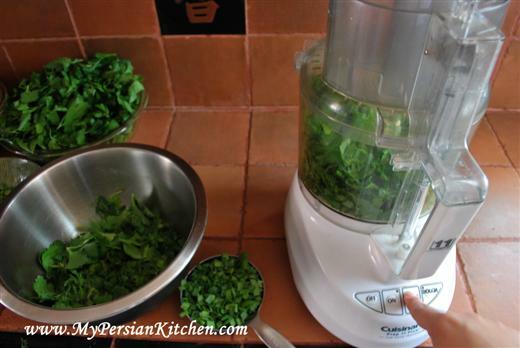 And here you have your chopped herbs in just seconds! I mixed the herbs together in a bowl since I don’t like to put chives in the Cuisinart. 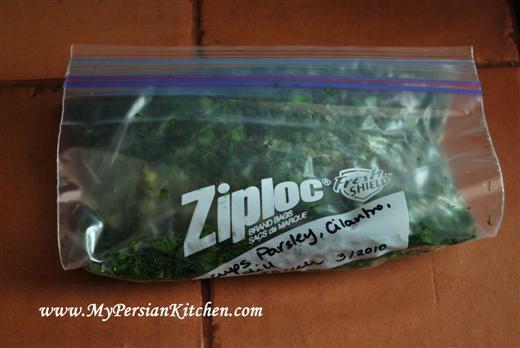 I wrote the amount of each herb on a ziploc bag as well as the date it was frozen. Fold over the ziploc bag and try to remove as much air as possible. This will also make the bag nice and compact so it won’t take too much space in your freezer. Go ahead and do the same with the rest of the herbs. Oh wow, what a great tip. Thanks for sharing. Bria, I am random too but had a huge surplus and had to think ahead. Not bad for an Aries, huh???!!! I’m a visual person and am really glad you showed step by step pictures of how to do it. Thanks! Wow, that really is a great tip. I had no idea you could freeze fresh herbs and I can’t ever get thru the whole bunch when I buy them, so I stopped buying fresh. Thanks Sanam! I love your site! It is truly a treasure for the Persian community! This is a great tip. Something that occured to me though, you could do this for specific recipies. 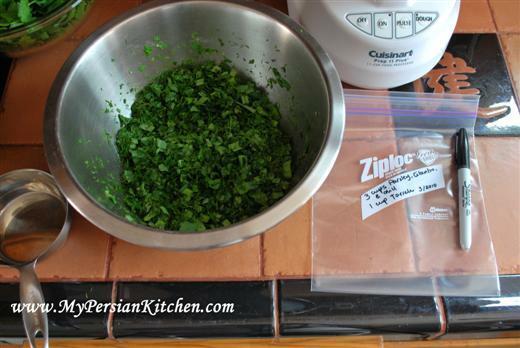 Recipies like Ghormeh Sabzi, that require quite a bit of preperation work, could be made a lot less daunting and less time consuming. Buying or harvesting herbs in season is better anyway! I make a day out of it. My daughter loves to help, and it makes the house smell great! I have one small request…. 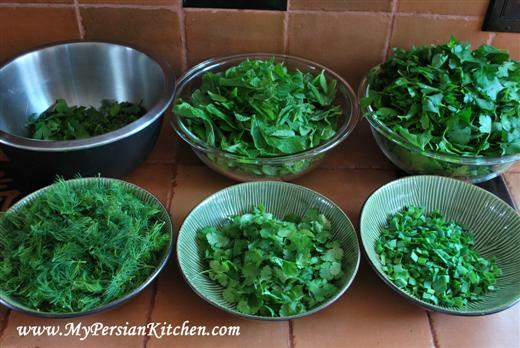 Could you do an article on a well stocked Persian kitchen? Such as; What to have on hand, spices, pantry items, fresh food, and so on. Shauna, thank you for your kind words. I am soon going to post about equipment as quiet a lot of people have asked me about my pots and pans and strainers!! But you are right, I should do a post on a well stocked Persian Kitchen!! Good idea!! How do you use frozen herbs in dishes that saute the fresh versions first? Do you thaw and saute or skip this step? Laleh, yes simply thaw and sauté the same way I would fresh herbs.